Coaching begins with a conversation about where you are in your work and life, and what is working or not working for you. Most people come to coaching because they are stuck and want a plan for moving forward. In this sense, a coaching conversation is always oriented toward the future. Some questions we always begin with: specifically, what are we here to do? What do you want to change? Why does it matter? What have you tried so far? What stands in the way of your progress? What is already working? We start with an inventory of your life and your circumstances today. A coach is your partner in discovery, supporting you in the process of identifying and drawing on your own resources and creativity to tackle these questions. Shifting your perspective is also easier when someone is listening closely and helping you to see and challenge your assumptions. What kinds of assumptions stand in most people’s way? Beliefs like “it is too late to change” or “I don’t have what it takes” or “it won’t make any difference” can lurk in our minds and set up roadblocks to progress. Coaches challenge your thinking so that you can get around the roadblocks with more ease and focus. What happens next? You will begin to see new choices as you shift your thinking and free yourself up from these limiting beliefs about yourself and the possibilities for change. We will work together to determine which new choices you want to make and develop ways to resource what you need to move forward. Coaching also involves action. Your coach will hold you accountable for the actions you commit to taking. Most of us move more decisively and confidently with a partner on the sidelines who is cheering us on. This is how we help you build your accountability to yourself. Taking action also builds confidence. 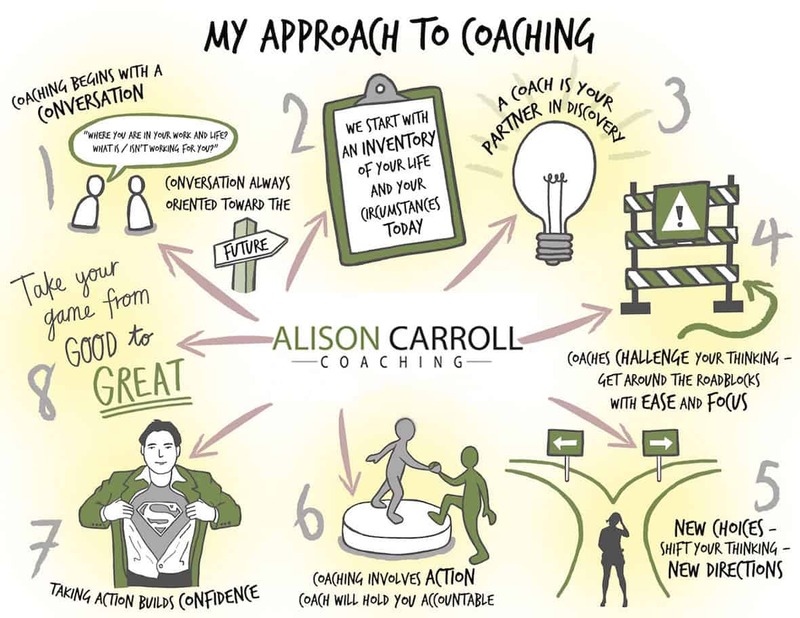 Many coaching clients find that as they begin to gain some momentum, they feel more connected to themselves and more clear about their capacities and what they may need to learn to sustain change. They feel more grounded and empowered.